Our search for answers begins with a question that often creates the most inner turmoil. In a sense, we implicitly feel that we should know the answer for we have our own sense of being alive. However, when we come to articulate the fundamental essence of what separates the living from the non-living, we often only succeed in raising further questions of a theological, philosophical and/or scientific nature. Life is defined by self-determined action. In this context, self-determined action is something that cannot be directly explained by the laws of nature. For example, a simple cell may only have the ability to move left or right, which action is selected might be described as self-determined by the individual cell. Of course, such decisions in very simple forms of life may be little more than cause and effect. However, if you pick up a pebble in your hand, your decision as to when and where to drop the pebble might be seen as a more tangible example of a self-determined action. In comparison, the sum total of all the complexity associated with nuclear fusion within a star appears to be determined solely by the laws of physics, not the individual star. However, as we forward even preliminary answers to such fundamental questions, they will lead to others equally problematic, e.g. I think, therefore I am. Why? Somewhere along the path of evolution on Earth, the attributes we call intelligence and sentience started to appear. While humanity may consider itself the end-result of this process, this is hopefully a premature conclusion. So how might intelligent life continue to evolve? Is humanity the only intelligence looking out at the Universe? Can we really expect to understand the universe without first accepting the limitations of present-day humanity? Overview presentation of the discussion of evolution by natural selection. 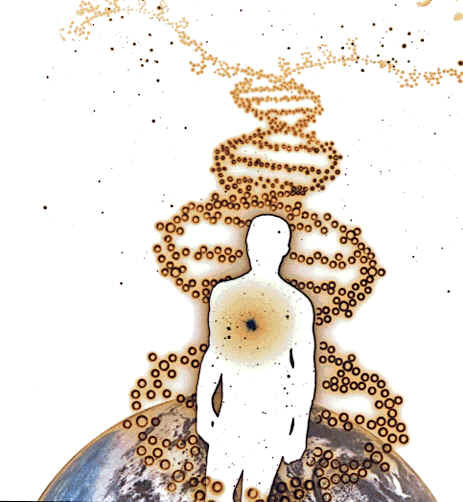 If you can write DNA, you're no longer limited to what is, but what can be.